Exceeding the maximum weight limits of your motorhome can make your vehicle unsafe on the road. 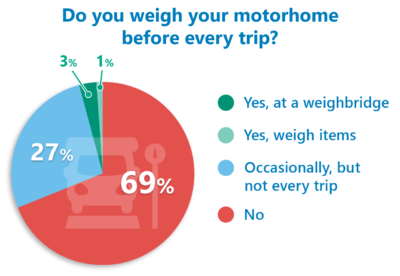 In last month’s community poll, we asked motorhomers if they weighed their leisure vehicle before every trip. With more than 300 votes, the majority said they didn’t weigh their motorhome before every trip – a huge 70 per cent of the votes. 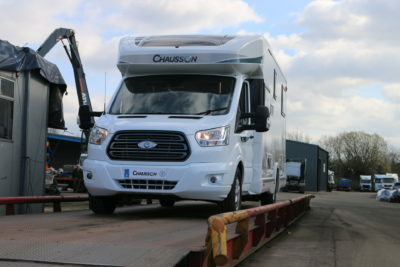 However, many commented that they had weighted their motorhome before their first trip away so were aware of their payload and weight limits. Twenty seven per cent of voters said the occasionally weighed their motorhome, but not before every trip. In our recent video on motorhome loading, we took a motorhome to a weighbridge to get an accurate reading of the axle weights and weight of the vehicle. But only three per cent of voters said they took their motorhome to a weighbridge. And only one per cent weigh the items they put into their motorhome before setting off on their travels. Andrew weighed his motorhome once – not before every trip. M Lawrence also weighed his once at a weighbridge. “Would not weigh again unless added a significant weight item to the van,” he commented. Bob Butler said he would normally weigh his campervan when they were going away on big trips abroad. “That’s when we have the maximum loading so we know when we camp in England we carry less,” he added. Dean Wood told us that he doesn’t weigh his motorhome before every trip – but gets it weighed before every MOT, with full fuel and water tank. If you take a similar amount of gear away with you on your motorhome holidays, then it’s probably not necessary to weigh everything, including your motorhome, every time you’re going away. But it certainly is when you first take ownership of your vehicle and pack it up for your first trip away to make sure you’re safe and legal on the road. 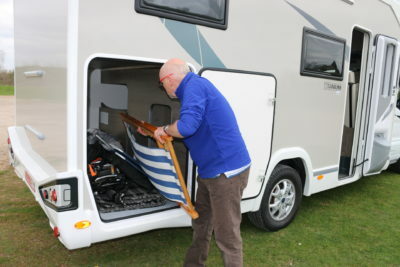 If you’re unsure about how to load your motorhome then check out our new video on safely loading your motorhome and read more about how to calculate its safe weight limits. Poll: Have you ever had damp in your motorhome ? How often do you get your motorhome habitation area serviced? How often do caravanners get their caravans serviced? The critical question is do owners weigh the individual axles or just the whole unit,my unit has 600kg spare but only 350 on the back axle with no storage of note ahead of mid wheel base. Looking around many manufacturers are falsely claiming payloads which are not feasible unless you fit a roof box over the cab and hang the spare wheel from the front bumper and motoring journalists are not pointing this out strongly enough. Many new motorhomes plated at 3500kg have hardly any payload. Manufacturers like.. Must be hundreds if not thousands of Van’s running illegally..On a forum I am on a guy purchased brand new van,,it was overloaded as soon as he and his wife sat in it..He did get his money back.